One of the trickier aspects of R/C tank combat is that of fitting a paintball marker, among other things, into the turret and getting a full load of paintballs to reliably feed the marker while the tank is underway and stationary. Most paintball markers use a simple hopper design magazine to feed paintballs, but the limited height in the turret makes such hoppers impossible to use. The magazine shown here holds a full supply of 40 rounds of 68 caliber paintballs, while occupying less than 2 inches of space above the marker. More importantly, it can feed the marker regardless of the elevation of the gun. it can be cleaned with water if a paintball breaks inside. The tubing is easy to cut with a knife and can be softened using a hair-dryer or hot-air gun to fit over a 3/4" copper fitting. The tubing is mounted to the inside of the turret using some brass braces and some wire-ties. The tubing is mounted with a slight downslope along its entire length, with more slope as it approaches the marker. Perhaps the most interesting aspect of this magazine design is the use of a homemade wire coil to provide a flexible connection between the tubing and the marker. This design was suggested by Will Montgomery and it works quite nicely to allow the magazine to be mounted rigidly to the turret, while the marker moves up and down as the gun is elevated. The coil was made by taking a piece of 12 gauge solid electrical wire and wrapping it tightly around a 3/4" wooden dowel. 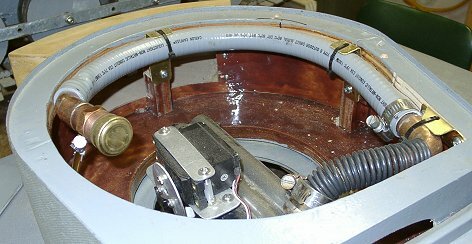 The coupling between the tubing and the coil is a short piece of 3/4" copper pipe that has been solder to a 3/4" street elbow. A street elbow has a straight piece on one end, instead of a coupling on either end, which means that there is no seam to stop a paintball. 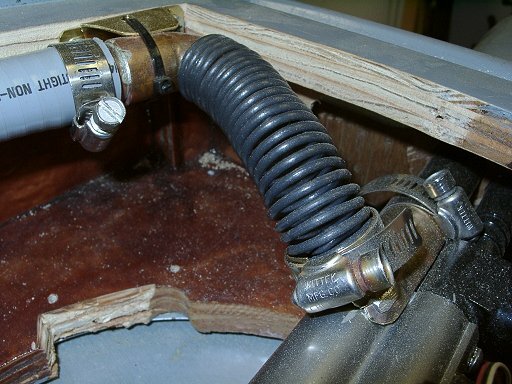 The 3/4" piece of pipe goes inside of the tubing (after a little heat is applied) and is held in place with a hose clamp, to keep the elbow oriented appropriately. The straight end of the street elbow is placed inside of the coil, which is held in place by friction (use some duct tape if you really want to be safe). The connection between the coil and the marker is a little tricky. For the most reliable feed, the coil should sit right over the breach, without any seam that might prevent a paintball from falling into the chamber. 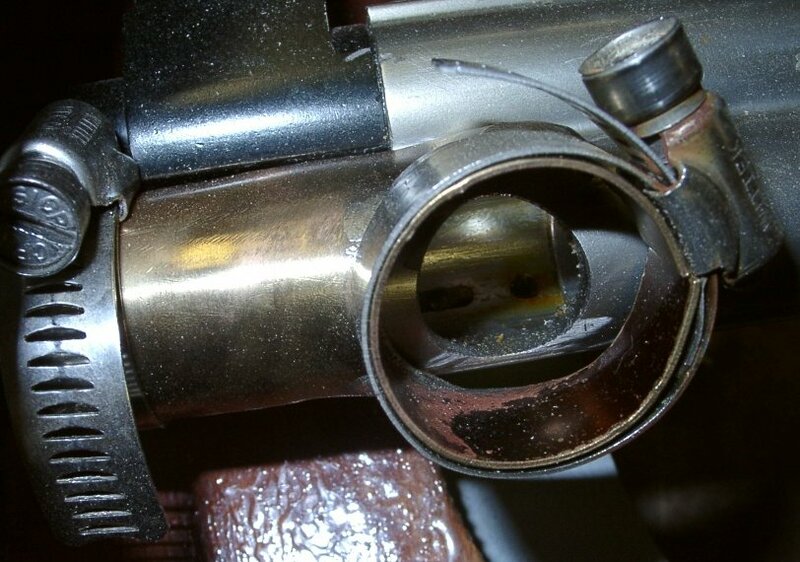 To that end, the aluminum feed tube that normally sits on top of the gun was cut off and filed smooth. A round brass socket was then silver-soldered onto a rounded over plate which matched the diameter of the barrel. With a little bit of fitting and filing, the two pieces were married up so that when the coil was placed inside of the coupling, the inside edge of the coil was flush with the feed hole into the marker. 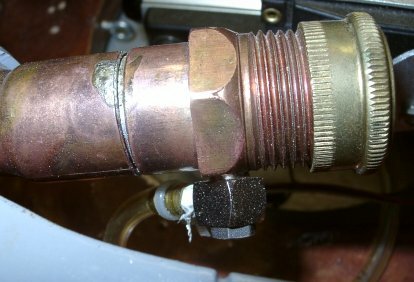 A hose clamp is used to keep the coil in the socket and another to keep the socket on the marker. The end of the magazine is capped off with a standard copper garden hose fitting and a thread cap. 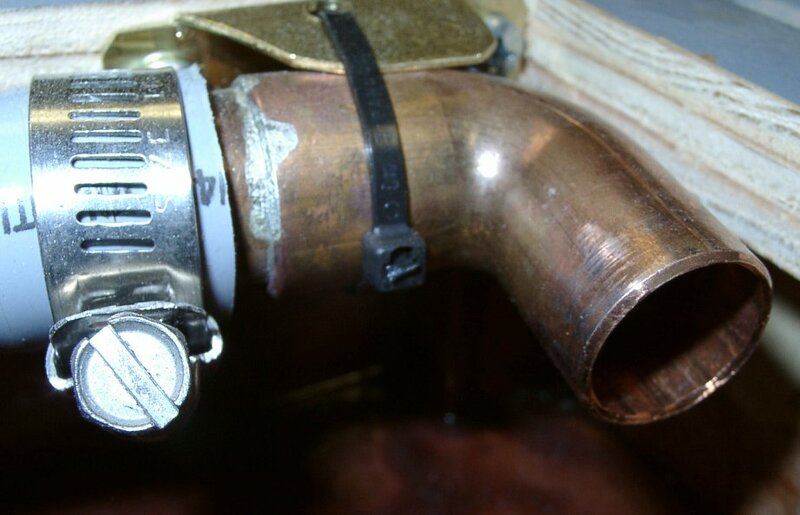 The tubing is heated up and then pushed over the copper fitting for a tight fit. For convenience, a 45 degree street elbow was also used, so that it is easier to turn the end cap and fill paintballs. To ensure that all of the paintballs move towards the marker, the end cap is fitted with a pressure feed that uses a burst of CO2 to encourage the paintballs to move towards the marker. 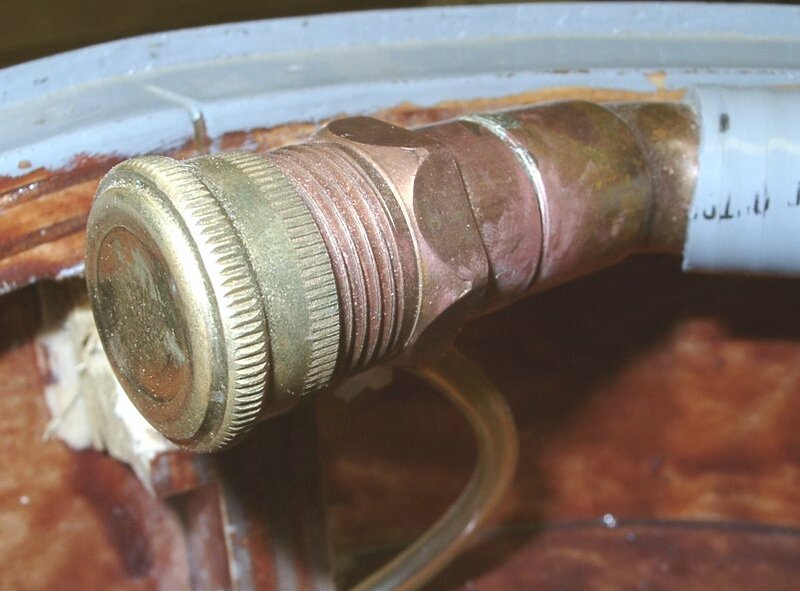 The pressure feed consists of a 10/32 inch hose fitting that was tapped into the end-cap fitting, with an 1/8" CO2 line attached to a CO2 supply of some sort. A burst of CO2 can be taken directly from the gun, by drilling a hole into the barrel and tapping it to accept a 10/32 inch fitting. When a paintball is fired, some of the CO2 pushing the paintball down the barrel will travel down the tube and into the magazine, pushing paintballs down the magazine. Alternatively, an air can be taken from a regulator attached to the CO2 bottle used by the gun, which is controlled by a low-pressure valve (e.g., 150psi). The valve can be tripped manually by a servo channel or by the same servo (or a parallel servo) that fires the gun.